The competition for Super Bowl LIII was strong, but so was our team’s determination to win our annual Chili Cook-Off competition and heat up the grill! Recently the Stafford branch celebrated the game by sporting our favorite team’s jersey, enjoying a large potluck, and sampling a variety of hearty chilis. From NFL teams to our hometown colleges and universities, there was plenty of team spirit in Stafford! Together, we enjoyed a potluck of delicious food throughout the day and seven employees made their best chili recipe for the cook-off. Employees then voted for their favorite based on the number assigned to each pot of chili – the chili pot with the most votes would be our winner! Thank you to all of our participants including Toni Mohrman, Bill & Revenue Analyst; John Lohmeyer, Director, Residential Sales and Agency Relations; Tricia McDaniel; Joyce Lopez, International Manager Client Services; Leslie Dobson, OA/DA Services; Harrison Howard, Quality Trainer; and Becky Antio, Bill & Revenue Analyst. The winner of the 2019 Chili Cook-Off competition is…reigning champion, Joyce Lopez! Congratulations, Joyce! Thank you to all who contributed to the potluck and to everyone who provided their best chili recipe for tasting! We look forward to seeing who will win the first place prize of the Golden Boot Trophy next year! Meanwhile, our Greenville team enjoyed a delicious, fun cookout together as well. Hamburgers were fired up on the grill and smoked wings were delivered for all to eat for lunch. The team was able to get together and chat about the game while munching on the seemingly endless supply of fruit, veggies and snacks. Thank you to all who participated in our fun leading up to game day - we look forward to continuing the tradition! 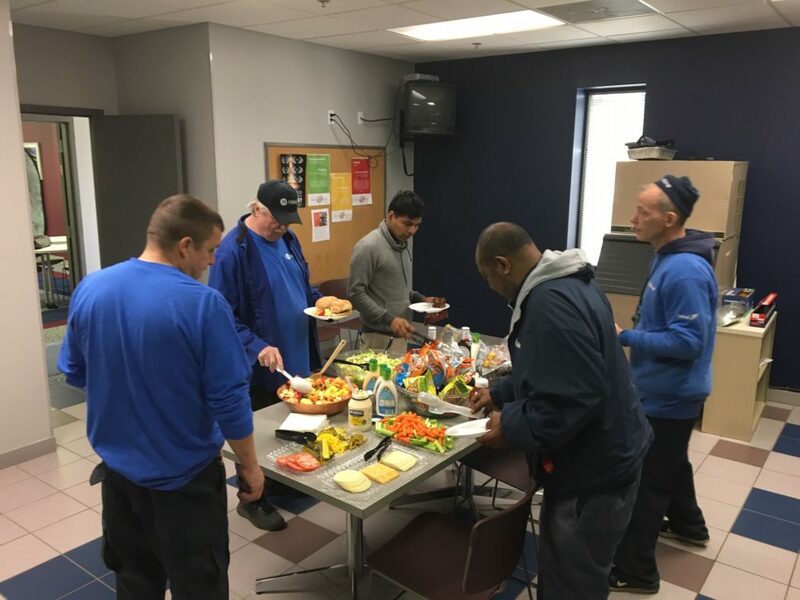 Our Greenville team enjoyed a delicious cookout to kick off Super Bowl weekend! 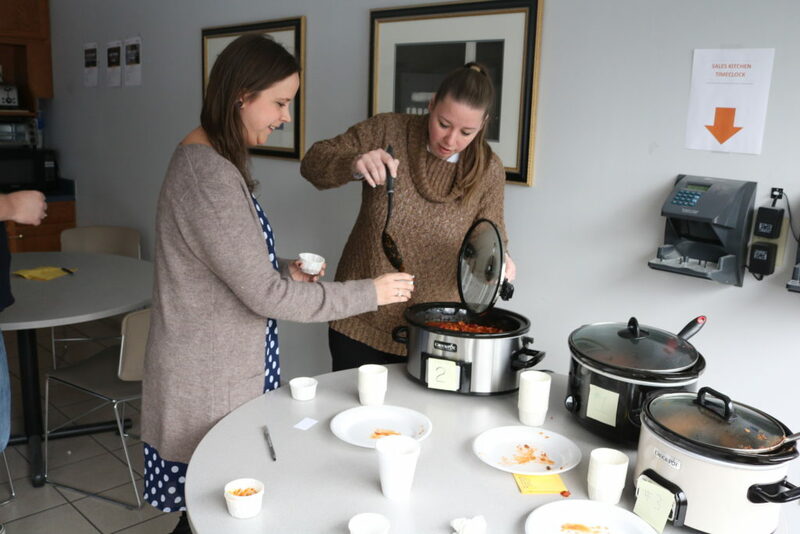 Stafford employees were encouraged to sample seven different chili recipes and vote for their favorite. Each pot of chili was assigned a number so that the cook of each chili was kept a secret until the winner was revealed! 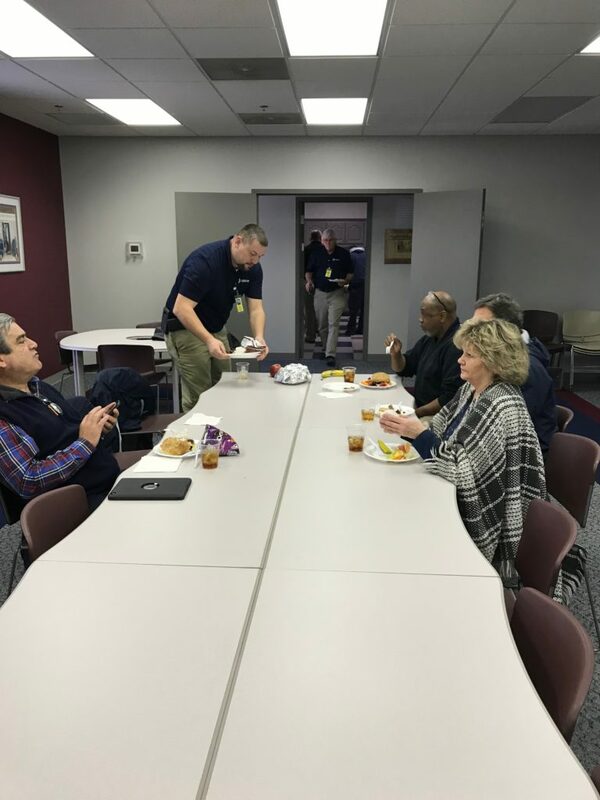 Greenville employees gathered around to enjoy the cookout luncheon together on Friday, February 1st. 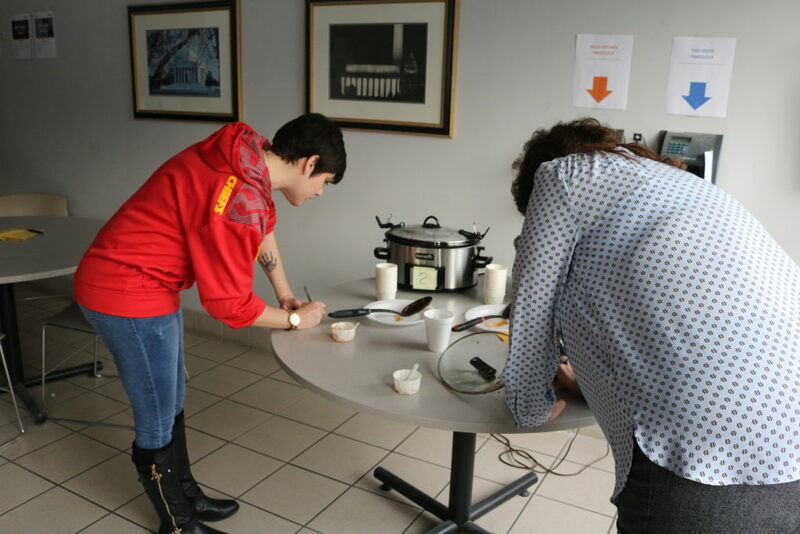 Darcy Duxbury, Customer Assistance Counselor, left, takes a small sample of chili from Carmen Garrett, Customer Assistance Coordinator, right, during the chili cook-off competition at the Stafford corporate office. 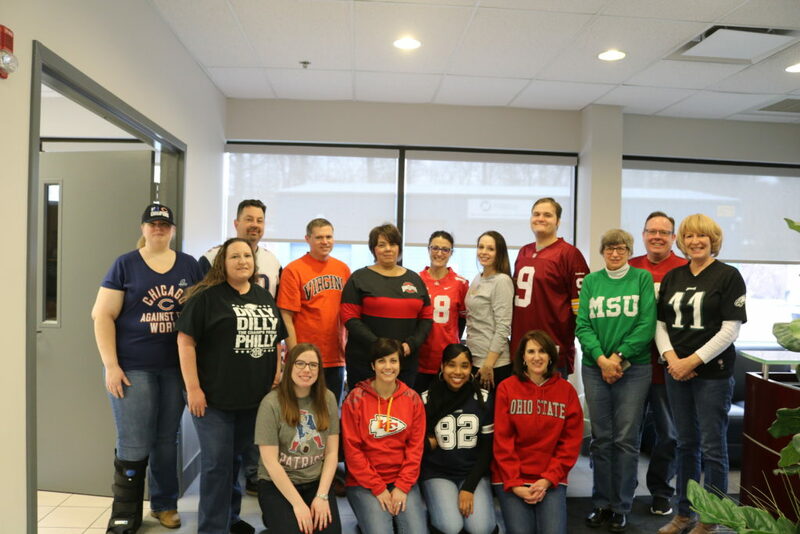 Stafford employees were encouraged to wear their favorite team’s shirt or jersey on Friday as we headed into Super Bowl weekend! 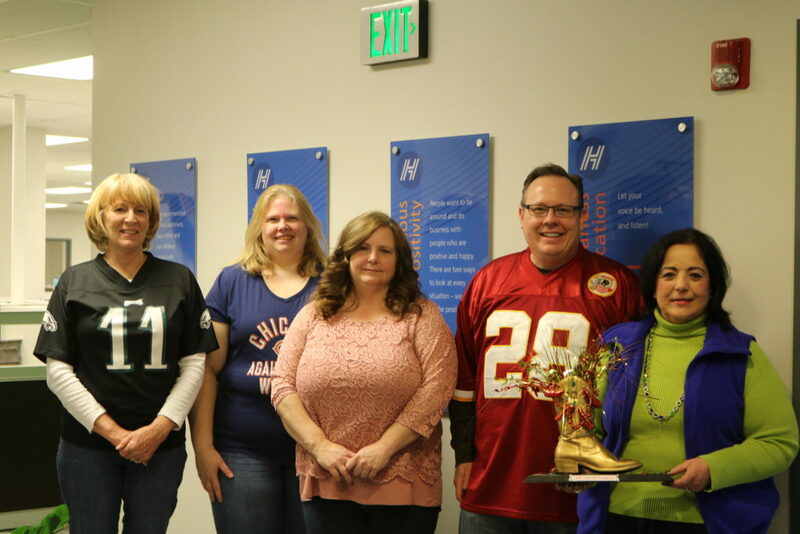 From left: Toni Mohrman, Bill & Revenue Analyst; Becky Antio, Bill & Revenue Analyst; Leslie Dobson, OA/DA Services; John Lohmeyer, Director, Residential Sales and Agency Relations, and this year’s winner, Joyce Lopez, International Manager Client Services, gather around for a photo with the chili cook-off competition’s top prize: the Golden Boot Trophy!